By Hellerick (Own work) [CC BY-SA 4.0], via Wikimedia Commons. Modified by Paul Brooker. I've created this distribution map of known Y haplogroup L, L1b2c or L-SK1414. This is my Y-DNA haplotype. Not a lot of dots there are there? This is how rare that this clade is. L1a and L1b most likely (in my opinion) originated during the last Ice Age circa 18,000 years ago, south of the Caucasus, and west of the Caspian Sea in Western Asia. In other words, in the area of present day Armenia, Azerbaijan, and North-west Iran. Again, I emphasise, that is just my opinion, looking at present-time evidence. Y haplogroup L itself may have diverged between L1 and L2, not so much earlier, or so far away from this region. Again, just my present opinion. My sub clade of L1b, is so rare, that it is impossible to say. 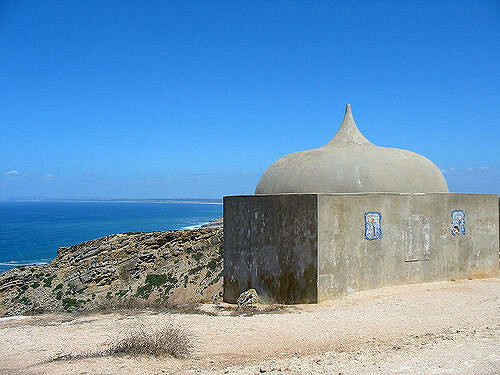 As can be seen from the map. However, this is my blog, so I'm going to push out on this one. My very best guess would be further to the East than it's parent. I suspect South East of the Caspian Sea, in what is now Eastern Iran. I could well be wrong. We have so few tests from nearby Afghanistan for example. So far, the SNP SK1414 has only been reported twice. 1) in Makran, SW Pakistan, in a Balochi speaking man. Balochi is an Iranian language, closely related to North-West Iranian languages. Researchers suggest that the Balochi people of Makran, largely migrated from south west of the Caspian. The only other guy in the world so far confirmed is little old me, an Englishman. I trace my surname (direct paternal) line back to the Thames Valley of Oxfordshire / Berkshire 270 years ago. If my biological line follows that. A number of STR testers of English descent appear connected to me by STR analysis. They all descend from Thomas Chandler, who lived around the same time as my earliest recorded ancestor - only 32 miles away at Basingstoke. From all of the evidence, I conclude that my Y ancestral line moved, probably in one generation, from Western Asia, perhaps from he edge of Persia, to Southern England conservatively between 2,000 and 400 years ago. Although I would speculate between 1,600 and 600 years ago - during the Medieval or close by. By Crates (Own work) [GFDL (http://www.gnu.org/copyleft/fdl.html) or CC BY-SA 4.0-3.0-2.5-2.0-1.0 (http://creativecommons.org/licenses/by-sa/4.0-3.0-2.5-2.0-1.0)], via Wikimedia Commons. Unmodified. The Y chromosome, and it's Y-DNA, are copied from father to son, down a strictly paternal lineage. If I were to trace my entire direct ancestry back, I have two parents, four grandparents, eight great grandparents, sixteen great great grandparents. 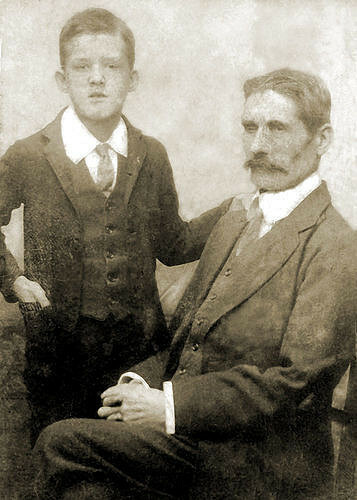 Yet out of those sixteen great great grandparents (generation 5), who were born only circa 160 years ago, only one carried the Y-DNA that was passed down to me. My eight great great grandmothers did not not inherit a Y chromosome from their fathers. Most likely, my other seven great great grandfathers, carried distinctive differently marked Y-DNA. Yet all sixteen biological great great grandparents have contributed to my overall atDNA (autosomal DNA). Only one gave me my Y-DNA. So you can see that Y-DNA represents only one narrow lineage. Y-DNA, may on the face of it, appear to offer a limited understanding of total biological ancestry. All sixteen of my great great grandparents were direct ancestors, not just the Y great great grandfather. However, this lineage offers us evidence that can be genetically tracked, then mapped into relationship. It could be done to ascertain parental, or non parental events. It can be used to check the biological validity of relationship to cousins. As more people investigate and record their haplogroups, haplotypes, STR markers, and SNPs, so we can for example, start to use them to map biological relationship further back. Y-DNA is particularly useful, not only because of it's markers, but also because it can be plotted to surname studies. In Western societies, the surname often follows the Y lineage for several generations. However, Y-DNA (nor the maternal mtDNA) evidence doesn't just stop there. As more people investigate, submit, and record their data from around the World - and as anthropologists and archaeologists add ancient DNA data from ancient and provenanced human remains to that record, so we can build and plot a world map of the human family, how it relates, how it was distributed globally throughout prehistory. Both Y and mt DNA carries mutation markers, that define a Haplogroup. A haplogroup is a family of shared descent. These haplogroups are ancient. 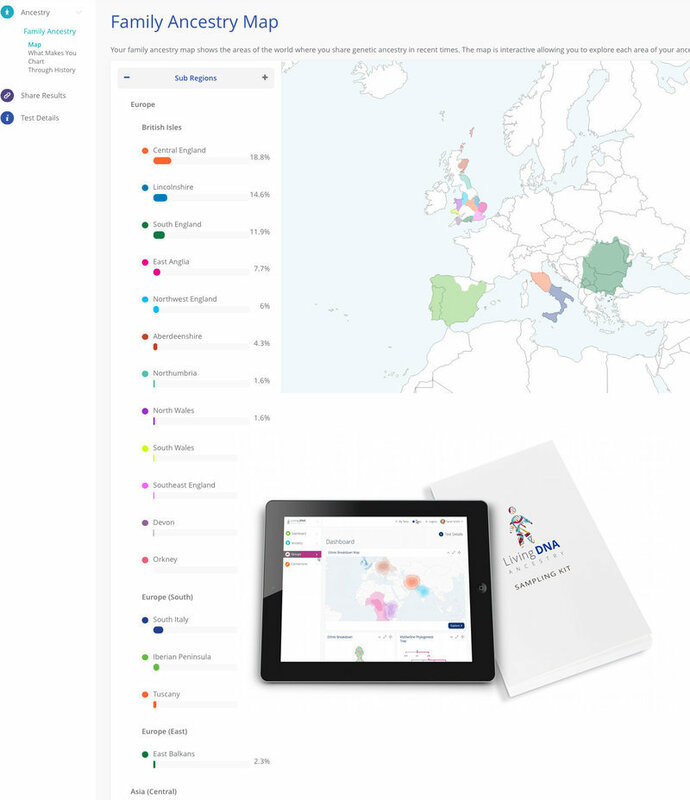 The paternal Y-DNA haplogroup that this resource page is dedicated to has been designated as L.
However, mutations do not stop with the formation of a new haplogroup. They continue through the generations. As lineages divide between different sons, across many generations, so these mutations in the Y-DNA for example, continue to accumulate down the diverging lineages that once shared common descent. We are all unique. The sub clade of L that this page focuses on is L1b. All male carriers of L1b will carry a SNP (Single Nucleotide Polymorphism) on their Y-DNA that has been designated as M317. This SNP will be downstream of another SNP that has been designated as M22. Finally, a Y-DNA can be said to have a terminal SNP. A terminal, refers not to the Haplogroup (in this case L), but can be used to define right down to the last SNP on the Y-DNA, that is shared with others on a record. If someone for example, carries Y-DNA that is proven (or predicted by comparison) to be Y Haplogroup L, and to carry M317, then their Y terminal could be designated as L-M317, or alternatively, as L1b. This is also sometimes referred to as a haplotype. However, a haplotype can also refer to a particular STR. 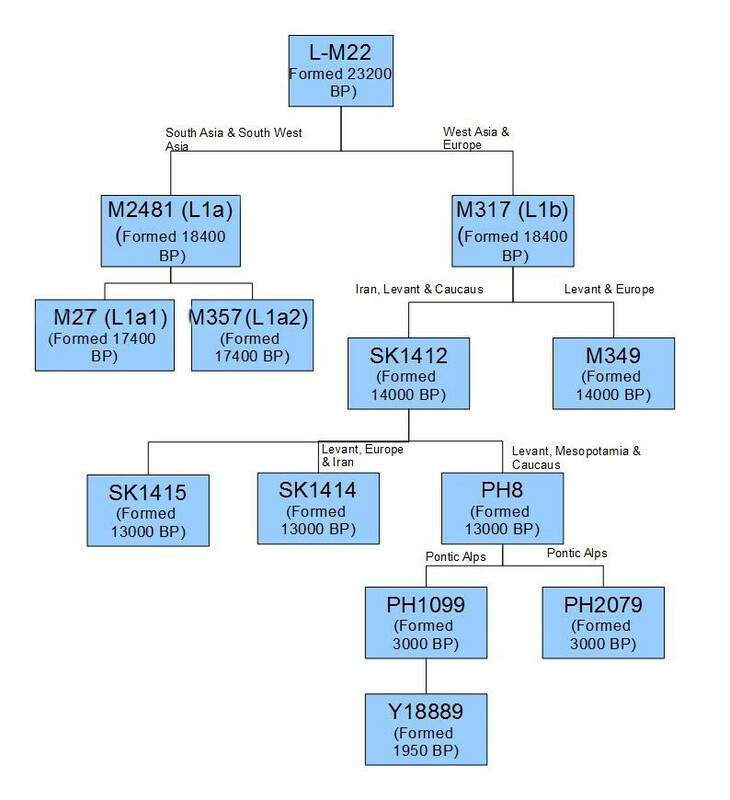 The above image illustrates a modern day distribution of Y Haplogroup L (M20) as proposed and created by Anthropogenica user Passa. Y Haplogroup K formed from Y Haplogroup IJK in the Y-DNA of hunter-gatherer fathers and sons, that share a MRCA (most recent common ancestor) during the Upper Palaeolithic, circa 45,400 years ago. Where did these Y ancestors live at that time? We think that they lived in Western or Southern Asia. Iran is a favourite proposal. Earlier Y ancestors had most likely exited Africa 20,000 years earlier, and were well established in Asia. They had most likely met and confronted another archaic human species, The Neanderthal. This was however, a time of great expansion by humans. The first anatomically modern humans had recently entered Europe, while other modern humans were arriving in Australia. The Ice Age was in a flux, but glaciation was advancing. The most recent common Y ancestor to carry Y Haplogroup LT lived circa 42,600 years ago. Then a mutation in the Y-DNA lead to the formation of Y Haplogroup L, with a most recent common ancestor 23,200 years ago, close to the time of the Last Glacial Maximum, when ice sheets were reaching their maximum positions. K, LT, and early L, most likely all originated in Upper Palaeolithic hunter-gatherer populations living during the last Ice Age, in the area of modern day Syria, Iraq, Iran or Pakistan. It was a time of increased stress on human populations, that were having to adapt to some severe environmental challenges, and may have at times faced isolation into a number of Ice Age Refuges. Some of these Upper Palaeolithic, Ice Age hunter-gatherer refuges may have been close to the Black Sea, others close to the Caspian Sea, but they were most likely located somewhere between Eastern Anatolia, and Eastern Iran, south of the Caucasus. The oldest divergence within Y Haplogroup L. L1, as characterised by the SNP M22, diverged from L2, as characterised by the SNP L595. L2 was only recently discovered, and forced an ISOGG revision of Y Haplogroup L and it's nomenclature that is still causing problems. In this article, unless stated otherwise, I am using 2017 Nomenclature. L2 or L-L595 is very rare, but has so far cropped up sporadically across Western Eurasia, including in Azeribaijan, Turkey, Sardinia, England, and Tartaristan. Unofficial proposed tree for L1 (L-M22) 2016. By Gökhan Zuzigo, modified by Paul Brooker. Proposed Migration Map of L-M22 (L1) by Phylogeographer at https://phylographer.com/mygrations/? 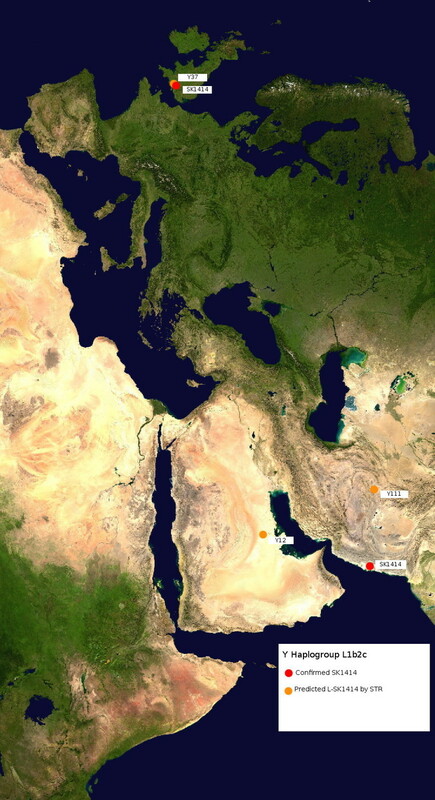 As can be seen above, this split occurred around 18,400 years ago, possibly somewhere between what is now Iran and Pakistan. The L1a branches inherit the SNP M2481, and the L1b branches inherited M317. First of all, let's look at L1a, because although it is not my sub clade, in terms of modern day population size, it appears to greatly outnumber any other L sub clade. Defined by SNP M27 (on older nomenclature as still used by 23andMe, this was formerly L1*) is mainly found in India, particularly South West India, and in Sri Lanka. This is perhaps the most populous modern day L sub clade, found in 15% of Indian males. However, it is not restricted to India, and has also been found in 20% of Balochi in Pakistan, and has also been reported in Kirghiz, Pashtun, Tajik, Uzbek, and Turkmen males across Central Asia. L1a and L1a1 (L-M27) at Birds Eye Cave, Armenia 6161 years before present. Ancient Y DNA from the Copper Age has emerged from this location in Armenia, and included L1a, and L1a1. This might suggest, that although very successful today in India and Pakistan, that it has a Western Asian origin. Has defined by SNP M357 (on older nomenclature as still used by 23andMe, this was formerly L3*). This sub clade is mainly found in Pakistan, but also Saudi Arabia, Kuwait, The Chechen Republic, Tajikistan, India, and Afghanistan. It has been found at 15% in Burusho populations, and at 25% in Kalash populations. It is much more common in Pakistan than in India. So, the L1a sub clades - spreading down into Southern Asia, and accounting for potentially millions of Y Men there. Far more than any other branches of Y Haplogroup L. However, Southern Asia is unlikely to be the origin of L. That origin is more likely, as stated earlier, to be the place with the most diversity in branches. That points more towards again towards Western Asia. It's just that ancient carriers of L, appear to have been particularly successful in Southern Asia, and to have fathered more sons there. We now move onto the branches of particular interest to myself, because I carry a Y Haplotype that belongs here. L1b is defined by the SNP M317, that formed circa 18,400 years ago, most likely in the area of modern day Iran, or elsewhere in Western Asia. L1b is mainly distributed across Western Asia, from modern day Turkey, across to Pakistan. However, as we will see, it also spreads in low densities across parts of Europe. it is very much, the "Western L". The Next split - L1b1 or L-M349. The Levant, and Europe! Around 14,000 years ago, another split occurred in the L1b (M317) branch. A new SNP, M349, defined L1b1. Today, L1b1, or L-M349, is found in Western Asia, in Lebanon, Syria, Turkey, Armenia, etc. However, it is also found scattered in low densities through parts of Europe. It crops up in South Europe, often close the the Mediterranean Sea, including particularly in parts of Italy. It also forms a light cluster in Central Europe. A working map of Y haplogroup L sub clades by Edward Chernoff. This map is incomplete, but is published here with permission of Edward Chernoff. Copyrights applied. 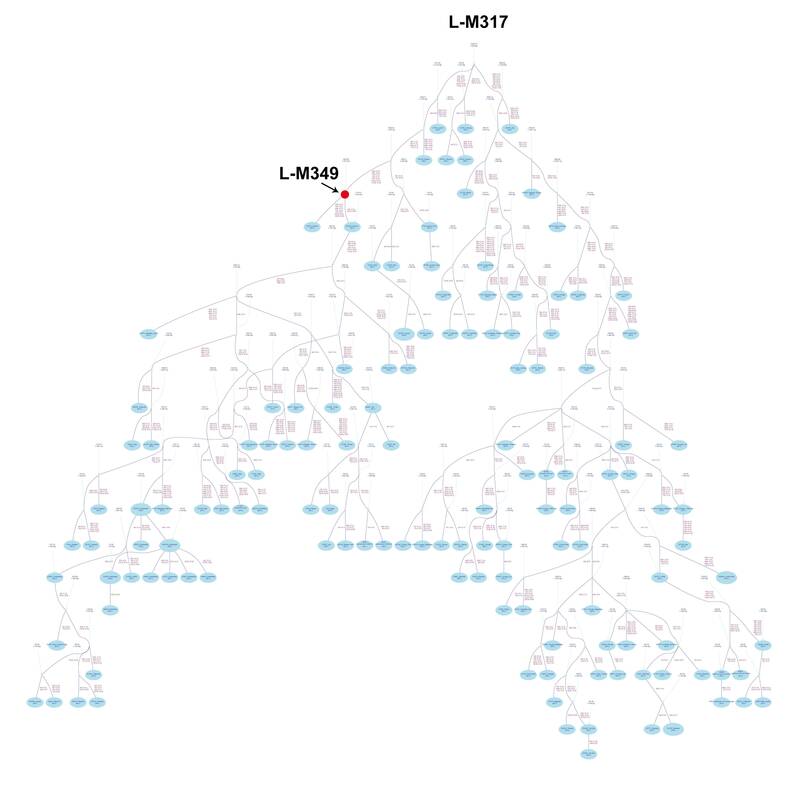 Branching away from a common Y ancestor with L1b1 (M349), is another 14,000 year old line defined by SNP SK1412, L1b2. 13,000 years ago,, during a cold stage towards the end of the last Ice Age, the L1b2 (SK1412) Y branch divides again. Very recent research suggests that it split into three lines: L-SK1415 (L1b2a), L-PH8 (L1b2b), and L-SK1414 (L1b2c). L1b2a (L-SK1415), has as far as I know, only been detected in a Makrani Balochi survey in SW Pakistan. L1b2b (PH8), is found in Turkey, Greece, Armenia, Chechen Republic, Iraq, etc. It is associated particularly with the Pontic Greek ethnicity from Eastern Anatolia, and around the Black Sea. A further division within PH8 has been detected at around 3,000 years ago. L1b2c (L-SK1414, FGC51074), has so far been SNP detected only in Makrani Balochi, in SW Pakistan, Lebanon (Druze), and in England. STR predictions for L-SK1414 have also been found in Goa, Syria, Iraq, Kuwait, UAE, Cyprus, Tartaristan, France, Italy, Saudi Arabia, Iran, Turkey, and Azores. In addition to SK1414, I have with the assistance of Gareth Henson, a FT-DNA Big Y test, accompanied by further analysis of their raw data, by Yfull, and FullGenomes, ascertained 117 novel SNPs looking for first time matches. As can be imagined, I'm very keen that further L Y-Men should test. 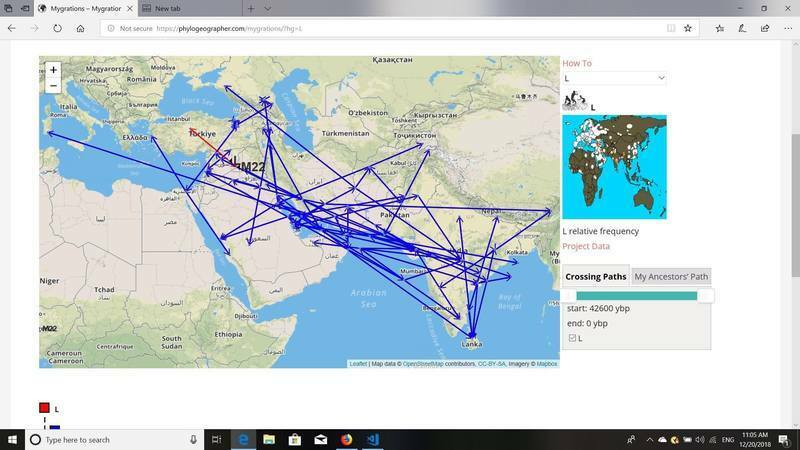 We have seen above, that again, and again, Y haplogroup L (M20), and several of it's sub clades appear to have Western Asian origins, despite success of some of those sub clades today in India and Pakistan. 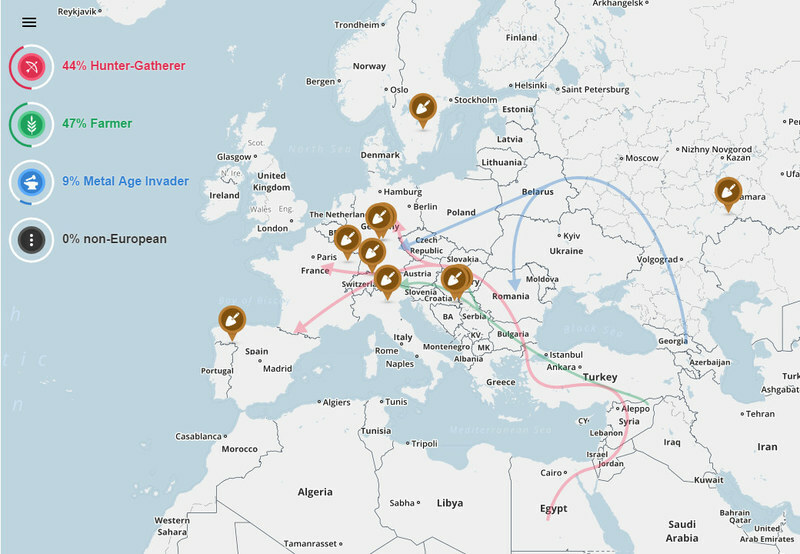 Y haplogroup L has not been linked to the Yamna hypothesis, that has taken credit for the origin of many haplogroups that are successful today in Europe. Y-DNA L was located to the southern side of the Caucasus, between present day Turkey and Pakistan. However, two particular Y-DNA L sub clades do make mysterious appearances across Europe. 1) L-L595 (L2) has only recently been discovered, so far, exclusively across Europe, in very low numbers. 2) L-M349 (L1b1), downstream of M317, also spreads across South Europe, and clusters at the Rhine-Danube. 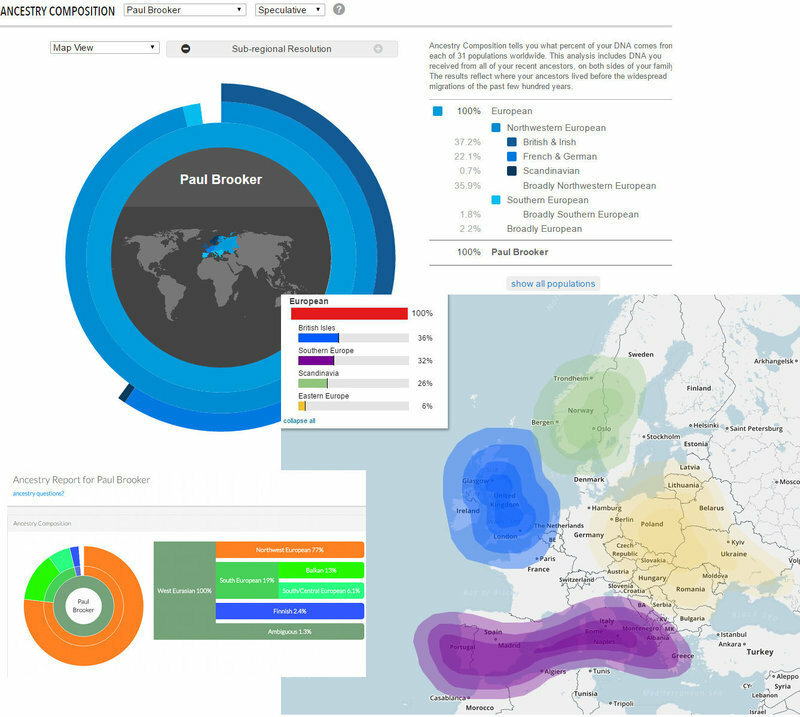 I have on 23andMe forums, seen a number of testers that unfortunately have not tested their Y elsewhere, claim Ashkenazi paternal ancestry, but this is far from common to all European L-M349 samples. Although rarely forming much more than 1% of all Y along the Mediterranean coast of Southern Europe, this percentage does occasionally rise higher, for example, in parts of Italy. When did L2 or even L1b1 enter Europe? L2 has only so far been found in Europe. There are some suggestions that some European L could be survivors from the Eurasian Neolithic. However, ancient DNA has not yet been found to support this hypothesis. 23andMe users should note that the company in 2016, still used a very outdated ISOGG nomenclature system. My 23andMe reported haplotype was L2*. However, using ISOGG 2016, this is now L1b (L-M317). NOT to be confused with modern day L2 (L-L595). For personal note as of 2018-08-28. SK1414/FGC51074 age estimate current 9,300 years bp. FGC51041/Y31947 age estimate current 6,000 years ago but only 2 samples on Ytree.